November | 2012 | Let There Be Food! Long time no see, my faithful foodie followers! We all know that sometimes life happens, yes? Hopefully, since the last time we’ve all been together, you’ve had delicious food encounters, been adventurous in the kitchen, and perhaps found a new favorite food. I’ve had a lot going on in my kitchen, and I’m looking forward to sharing it all with y’all. The dish for this particular entry was born of my constant search for something fun and different to do with chicken breasts. One night, a search through my fridge turned up puff pastry and Laughing Cow cheese wedges. I thought to myself, “Surely I can combine these things for something delicious!” A quick Google search showed me that I wasn’t crazy and provided a template for my adventure. 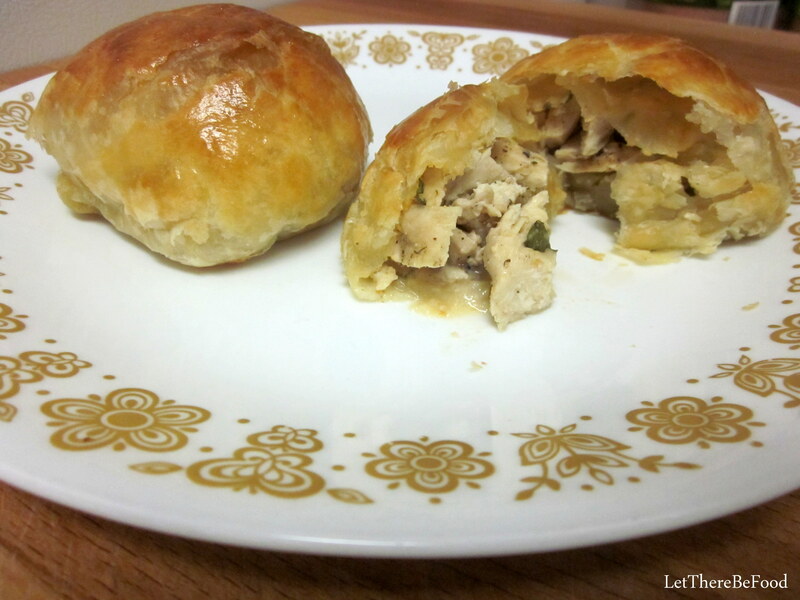 Now I bring my adventure to you: chicken pastry pockets! 1. 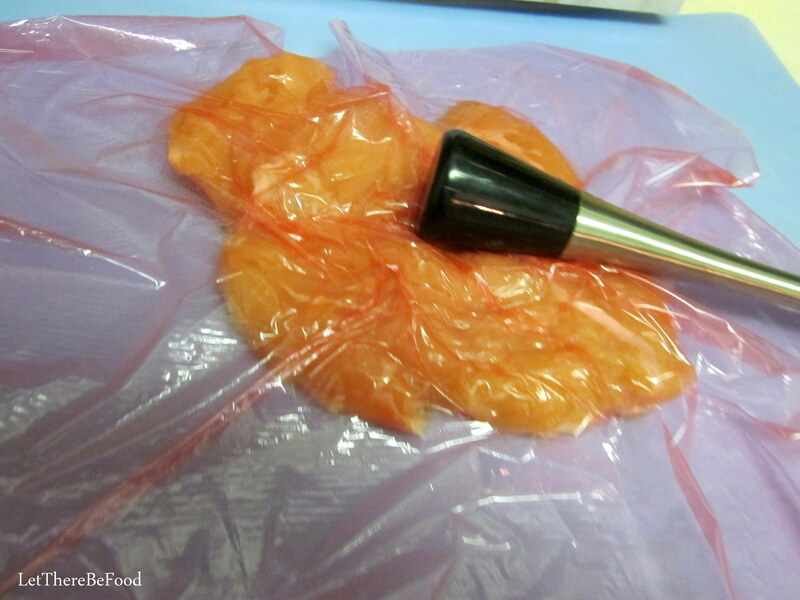 Take your chicken breast and put it on a cutting board, cover with plastic wrap, take a flat-bottomed implement, and then pound the chicken breast until it’s all one thickness across. I don’t go for a particular dimension, just something that is uniform. My implement is a drink muddler, but use whatever you have…a heavy drinking glass, a meat mallet, or a heavy skillet. 2. 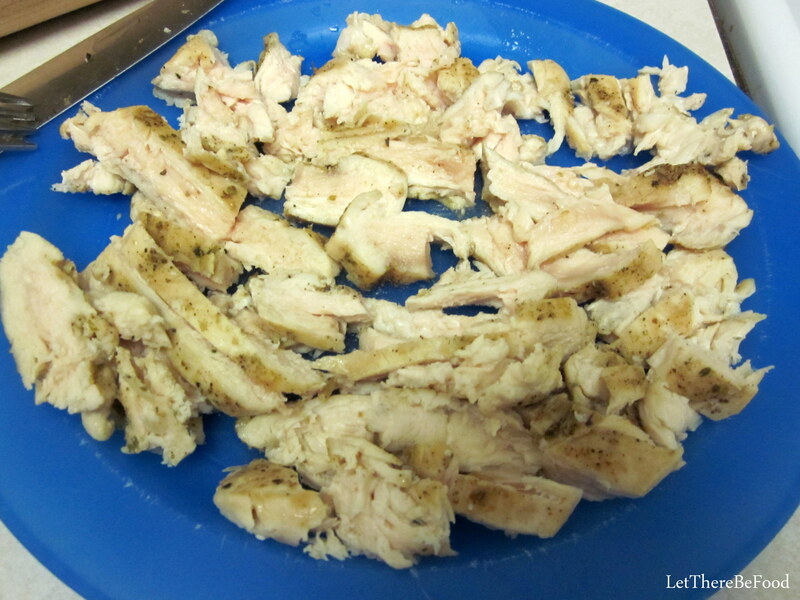 Season your chicken breast on both sides with your chosen seasoning. I went with Greek because the flavors go well with the cheese. 3. Pre-heat your oven to 400 degrees. 4. Preheat your skillet by placing on the stove turned to medium-high heat, or 5 out of 10. Add your olive oil, and let it heat up for 2 – 3 minutes. 5. 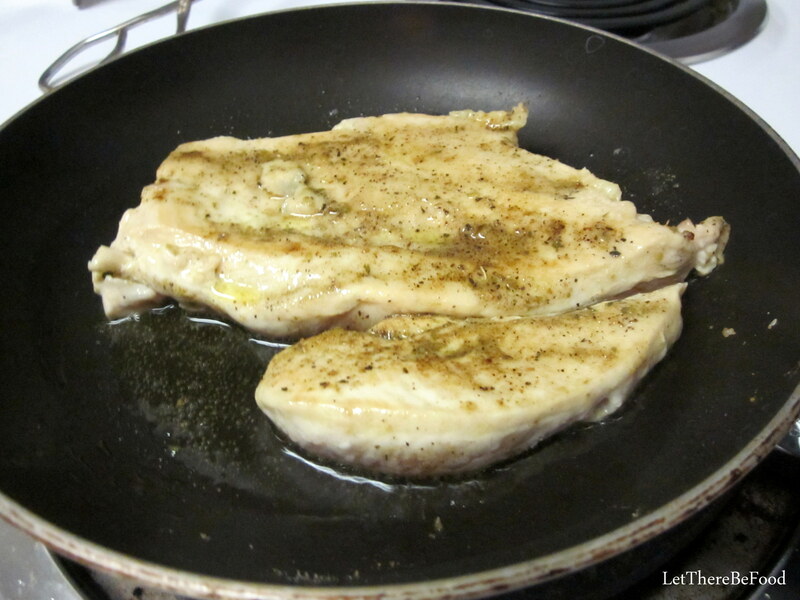 Add your chicken breast and cook about 3 minutes on each side. You don’t want or need to cook it through as there will be more cooking time in the oven. You are browning it and just starting the cooking process. 6. In a bowl, combine the cheese wedges, minced garlic, and the chopped basil leaves. 7. 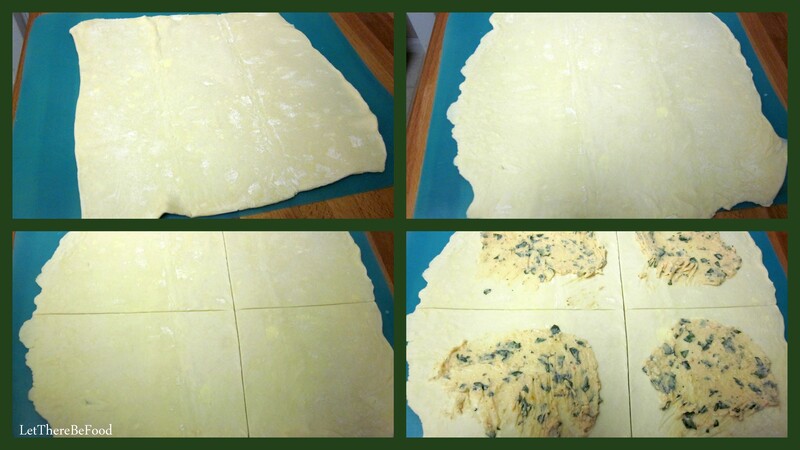 On a clean cutting board, place your puff pastry sheet, and begin to gently use a rolling pin to roll it out and make it a little thinner, and extend the edges. 8. When you remove the chicken from the heat, let it cool for a few minutes (perhaps while you finish step 7) before you chop it or slice it into small pieces. Don’t worry if there is an undercooked section in the middle. The chicken will finish cooking in the oven. 9. 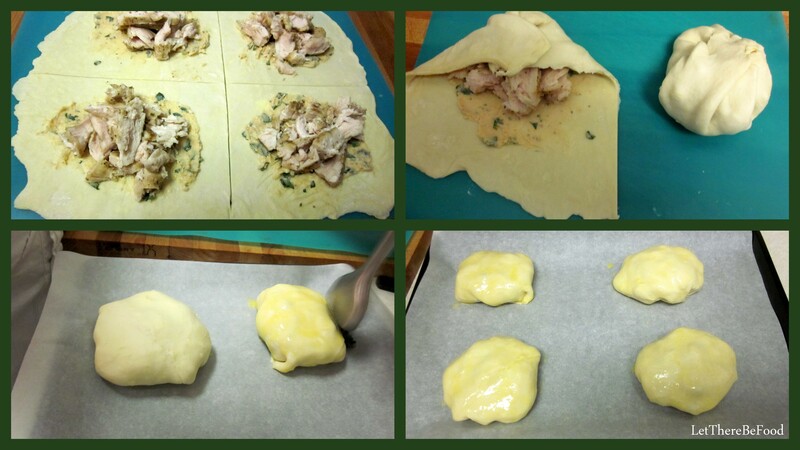 Score your puff pastry sheet into quarters. Spread your cheese mixture evenly onto each quarter. Just eyeball the amount. Add the chicken pieces on top. 10. Carefully, pick up each quarter’s edges and fold/tuck them over and on top of each other until all the edges and corners are folded up. Pick it up as a bundle and place it on a parchment paper lined or greased jelly roll pan, seam-side down. 11. In a clean bowl, beat an egg, add a splash of water, and then brush your mixture over the pastry pockets so they’ll bake up a lovely golden brown. 12. Bake for about 12 – 15 minutes. In my oven, I check them at 10 minutes and rotate the pan to ensure even browning. As always, when you take it out of the oven, give it a minute to cool before you eat to avoid scalding your tongue! I hope you enjoy these as much as folks in my home have! I believe that you could substitute the flavor of Laughing Cow cheese for a tasty variety in your pastry pockets, but so far I’ve stayed with the tomato and basil option. In terms of leftovers, they do keep for the next day or two and microwave at work just fine. The puff pastry will lose its crunch. But it will still have the deliciousness you had from the day before. Let’s chat about puff pastry for a moment or two, shall we? I’ve heard on Food Network and seen several recipes that talk about keeping puff pastry in your freezer as a kitchen staple. I agree that is a handy recipe ingredient, and fairly versatile as well. However, let’s be real that puff pastry is not an economical ingredient, really. I cringe when I buy it, and I don’t buy it often. 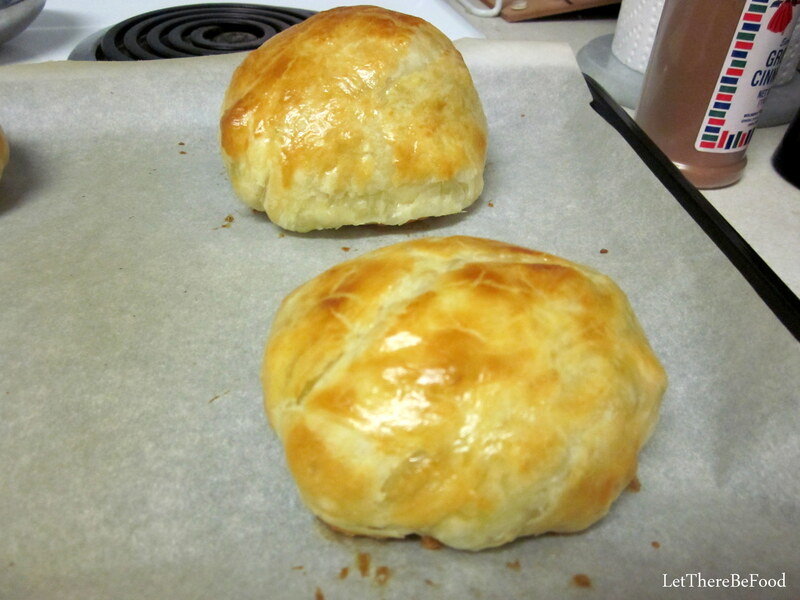 Lately I’ve been using crescent rolls as a substitute for puff pastry in a lot of recipes, although I have not yet tried it here. Crescent rolls are less expensive and so far seem to work just as well, although they are a little flimsier, in recipes where I’ve substituted them. For a while, my grocery store stocked crescent roll sheets instead of the triangles. The sheets don’t require as much manipulation, and that made them easier to use as a substitute. I’ve wondered about pizza dough and its efficacy with this particular dish. It might turn out to be somewhat like chicken calzones. If you try it, let me know! 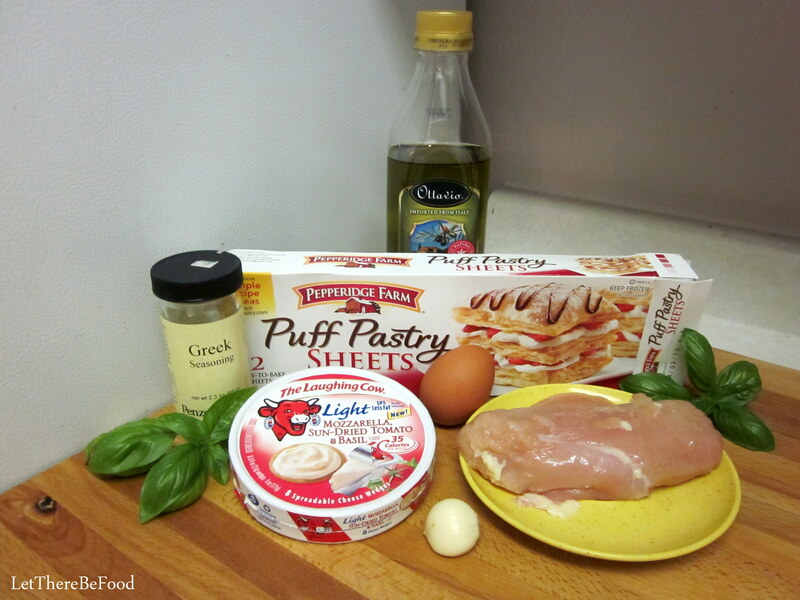 Even with these options, I do think that puff pastry is worth the splurge, now and again. While the puff pastry may balance it out calorically, I do appreciate that Laughing Cow cheese is a healthier alternative to cream cheese, which is what I saw commonly used as a binder in this type of recipe on the web. Plus it comes already flavored! In terms of your additional flavor boosters (here, the garlic and basil), I think you could vary it as long as you stuck with the theme of the cheese. If you wanted, you could chop up some sun-dried tomatoes or other Italian herbs. If you were using the Garlic & Herb Laughing Cow cheese, any complimentary herbs could be used with a clove or two of garlic. Should you venture out into the Queso Fresco & Chipotle, I still think the garlic clove would be a good idea with perhaps some peppers of your choice. A little Mexican oregano would also be appropriate, I think. There are so many possibilities for flavor additions! I know that so many of us eat chicken frequently and are thus constantly in search of creative ways to serve up new chicken dishes. I hope this has inspired you to try something new in your home with just a few ingredients that you might not have thought about combining before. The prep goes quickly, and it’s incredibly tasty every time. Let me know how you like it! Happy eating!